Solar EUV, by exciting Oxygen molecules, creates thermal winds in the ionosphere whose dynamo effect changes the earth’s magnetic field. 2. The diurnal change in the earth’s magnetic field as a result of the sun passing from east to west has been measured for a long time. 3. Rudolph Wolf discovered that his relative sunspot numbers correlated extremely well with the range of this diurnal variation. 4. The “East Component” (called Y in the Catresian sense where X is north and Z is vertical) of this diurnal geomagnetic change scales incredibly well with the expected theoretical square root of Solar EUV as measured by the SOHO spacecraft since 1996. The fidelity of this scaling is all the more surprising as its theoretical base is the happenstance that the Pederson and Hall electron densities scale at SQRT F10.7 at the altitude of photochemical neutrality. 5. F10.7 microwave flux is a very good proxy for Solar EUV and it has been measured in Canada and Japan since the late 1940’s and 1950’s, respectively. 6. Thus Relative Sunspot Number=Delta East Component=SQRT Solar EUV=SQRT F10.7 flux. 7. An important observation is made that the Relative Sunspot Number has failed to follow the program for the last two solar cycles, but the Group Number has continued to do so. It is suggested that this is a result of fewer small sunspots. 8. Thus, Group Sunspot Number=Delta East Component=SQRT Solar EUV=SQRT F10.7 flux. 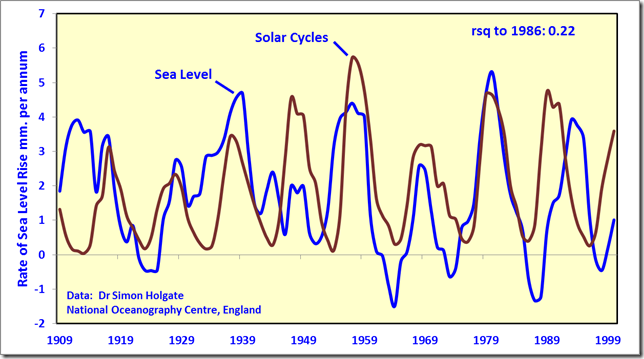 David Archibald proposes per the graphic above that the Solar Cycle controls sea level. Well, there seems to be a relationship all right but he is using the derivative rate of change for sea level rather than the actual levels and one might conclude that the sea level rate of change leads the solar cycle much of the time. 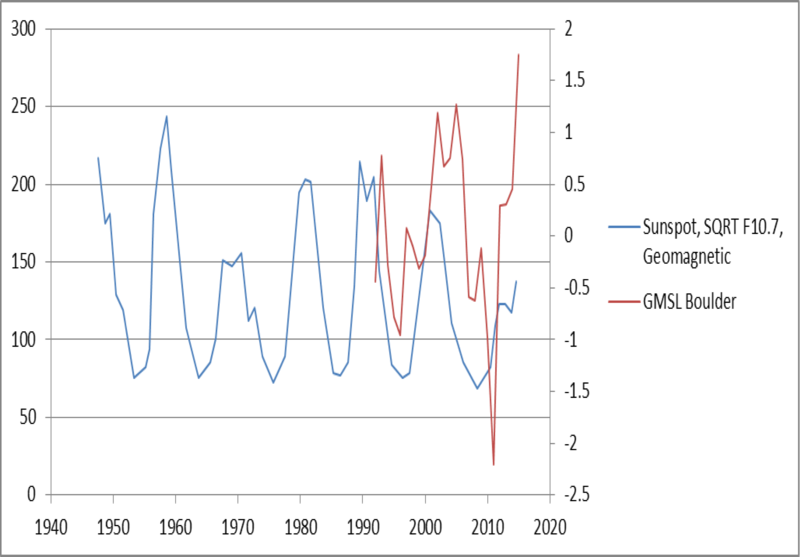 Using Leif Svalgaard’s data from his paper summarized above and comparing it with global mean sea level produces an interesting but very different result. I warm my coffee when it has cooled with microwaves rather than a black light for good reason and it is very tempting to look to UV and EUV warming of the oceans as the solar connection. Group Sunspot Number=Delta East Component=SQRT Solar EUV (space)=SQRT F10.7 flux (earth). One supposes that the sunspot number as a proxy for solar magnetic changes is the driving force of solar EUV flux. The same SQRT scaling applies to sunspots from both 1.5 million kilometers in space on the SOHO and the F10.7 flux measured at the earth surface. The SQRT relationship cannot result from modulation at the ionizing layer at about 105 kilometers. The SQRT relationship between sunspots and EUV, whatever its theory, is fundamental and arises at the sun. Furthermore, the ionization and deflection of the earth’s magnetic field cannot significantly diminish the total EUV energy or it would scale differently from space and at the earth’s surface. We can add sea surface temperatures to the graph, but they are dancing to drummers besides the sun. They don’t even relate meaningfully to sea level. Enough energy from the sun strikes the earth to satisfy human energy needs, including raising living standards in the third world, for the foreseeable future. The difficulty lies in accessing it. The same difficulty seemingly applies to attributing climatic changes to the sun, unless the purely magnetic effects work in ways unrelated to their intensity. This entry was posted in Climate, Oceanography, Solar EUV and tagged delta Y, F10.7 microwave flux, Geomagnetic East Component, Sunspots. Bookmark the permalink.